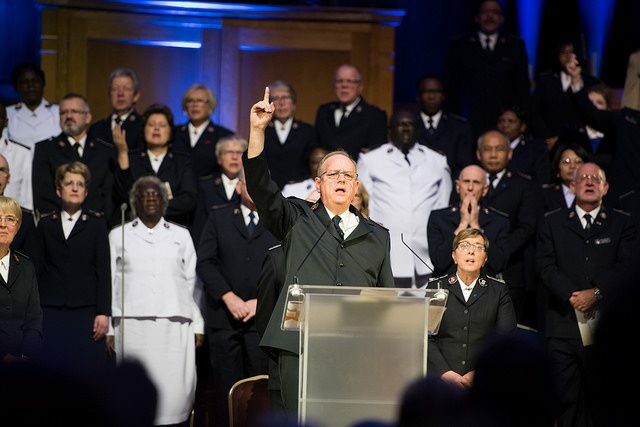 In the Welcome to the High Council and Farewell to General André Cox and Commissioner Silvia Cox (World President of Women’s Ministries) May 19, the General’s message was clear: every person can change the world if they give themselves over to God. This was backed up by stories from the international leaders’ lives that demonstrated how, through service and sacrifice, they have made a personal impact around the world that will last long after they retire in August. 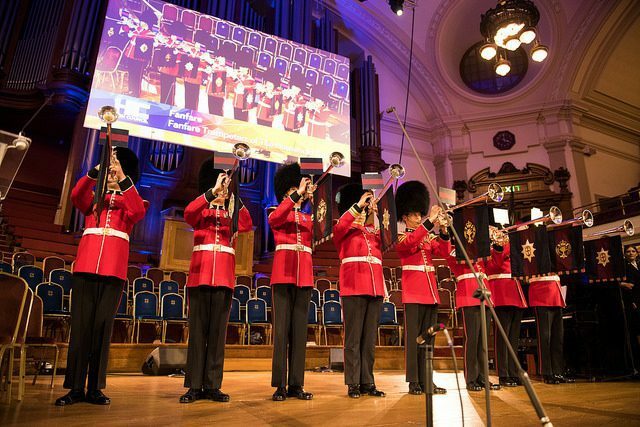 The event in Central Hall, Westminster, began with the Fanfare Trumpeters of the Household Division of the British Army, resplendent in red tunics and bearskin hats. The congregation rose to welcome the Coxes, who were followed into the hall by the 108 members of the 2018 High Council. Music played an important role in the meeting, from lively pre-meeting contributions by the International Staff Band (ISB), International Staff Songsters (ISS) and Boscombe Timbrels to pieces that brought about an atmosphere of prayer and contemplation. 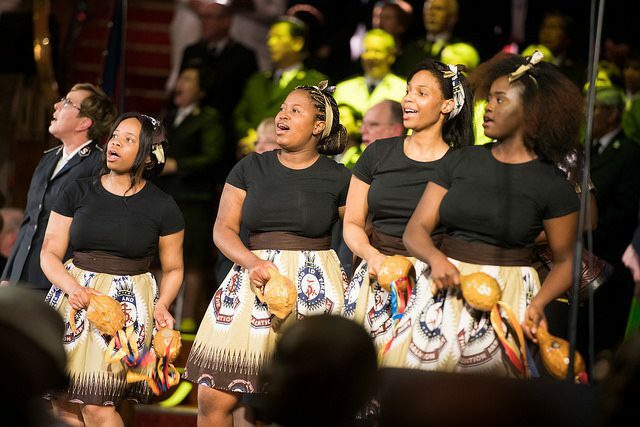 Gemma Hinchliffe sung “The Prayer,” accompanied by the ISS and trumpeter Simon Cox (nephew of the Coxes), followed by singing, dancing and drumming of African Praise, a British group made up of Salvationists from Zimbabwe and other African countries. The African influence—appropriate for the farewell to The Salvation Army’s first Africa-born General—was felt throughout the afternoon. “If I Were the General …” gave opportunity to three young people to offer their thoughts on what a General should be and do. Daniel Rose and Joel Lalhmingliana—featured in a video presentation—came up with innovations such as giving out chocolate bars to encourage people to attend worship, allowing trombones to play at double forte and keeping sermons to four-minutes long. Addressing the congregation in the hall, Emma Góchez considered some ideas for making Army uniforms more practical and fashionable but also spoke about the importance of using teenagers already in The Salvation Army to help other teens who were struggling. “We need to let more light into this dark world,” she said. An African-style arrangement of “They Shall Come from the East, They Shall Come from the West” began with playing and singing by some of the ISB and grew to take in the whole congregation, with drumming and dancing from African Praise. “Consecrated Service” was a new piece by Bandmaster Richard Phillips, written as a musical tribute to the General and Commissioner Cox. Featuring the ISB, ISS, Gemma Hinchliffe, Simon Cox, African Praise and Boscombe Timbrels, the work took the listener on a journey through the term of office of the General, from the early sacred moments following election through to their taking the message of being a consecrated, mobilized people around the world, all using well-known Salvation Army songs. Two members of the High Council paid tribute to the retiring leaders. Commissioner Margaret Siamoya (Territorial Commander, Zambia) thanked the Coxes for showing Spiritual leadership. She complimented the “dancing General” on his championing of the Accountability Movement, his leadership at the International Congress in 2015 and the introduction of “The Whole World Mobilising” initiative, which she said has had a great impact in her territory. The commissioner paid tribute to “Mama” Silvia’s impact on souls and particularly her advocacy for women’s development. Songs from the ISS led into the congregation singing of “Holy, Holy, Holy” before a video presentation reminded the congregation of the General’s “I Dream” statements that had underpinned his term of office, focusing on The Salvation Army he wanted to see—an accountable, mobilized Army that gave young people a voice. The General said he was delighted to see some aspects of his dream become reality. He acknowledged the support he has received as General, from the prayers of Salvationists worldwide to the way that he and Silvia Cox have been “released” by their family. Far from being satisfied, however, he warned: “The Salvation Army around the world has the potential to be so much more!” And while he acknowledged that there are successes, he pointed out that when things are going well, it can become easy to stop relying on God. “Woe to us if we ever forget the Lord in our Army,” he said. There followed sacred moments as the ISS sang and people moved from the congregation to kneel at the mercy seat. Some members of the High Council moved to speak to the seekers while others quietly stood from their seats in an attitude of prayer and solidarity. As the congregation gave a full-throated rendition of the seven verses, the music groups that had taken part joined in one by one, including the fanfare trumpeters who stood on the balcony, and officers from International Headquarters who waved flags, until the final verse, “And now, Hallelujah, the rest of my days shall gladly be spent in promoting thy praise,” reached a glorious conclusion, followed by a long, spontaneous round of applause. 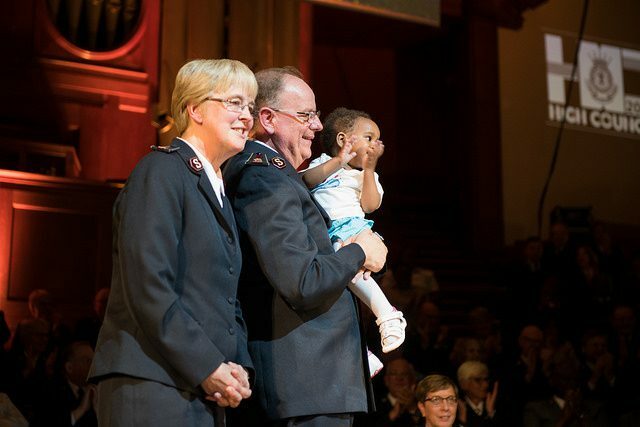 The congregation may have come to pay tribute to The Salvation Army’s international leaders and welcome the group that will choose the next General, but they left having praised God and committed themselves—on a very personal level—to being a light for God in the darkest places of the world. 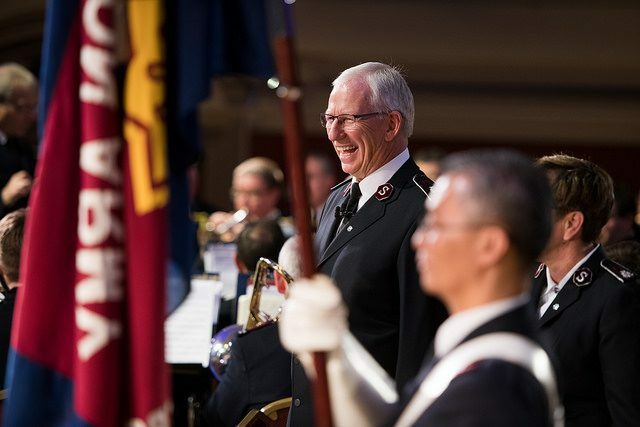 Watch a replay of the meeting via salvationarmy.org/highcouncil2018.